Natural Healing Tools: Got Sore Muscles? WelAide heating pade utilize natural negative ions and far infrared from jade stones. 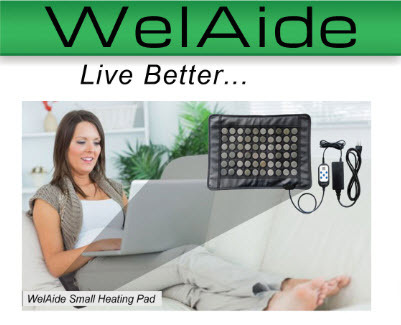 This allows WelAide's pads to be more effective than traditional heating pads. Negative ions have been known to help provide a sense of ease and calmness. Every pad incorporates high quality, natural jade stones to help optimize the therapeutic results from the heat. When jade stone are heated, they emit long wave far infrared energy which is able to penetrate the body up to three inches deep. This allows the heat from WelAide pads to penetrate deep below the skin's surface for a more uniform heating experience. Available in Extra Small, Small, Medium and Large!